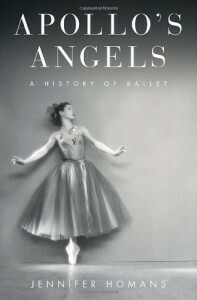 The first two-thirds was a fascinatingly detailed history of ballet and its relationship to the politics and events around it, if a bit heave on metaphor and a bit light on physical description. Unfortunately, in the last third it decended into rather snobbish Balanchine hagiography, which pulled it even further toward the emotional and away from the concrete.Also, I think I've been spoiled by reading as much children's and YA nonfiction as I do, which are often beautifully designed and heavily visual; this was largely lacking in visual material, despite being about an art form that audiences watch, and what was present was poorly arranged and presented. Most of the images--even black and white ones--were constrained to three glossy-paper photo-sections, and within and among those sections there was basically no sense of organization. There were some black and white photos interspersed with the main text, but only once every ten to twenty pages, and the captions tended to repeat sections of the main text rather than adding new information that would expand our understanding of the subject through the visual.